Famously dubbed the "mad dog of the Middle East" by former President Ronald Reagan, Libyan leader Muammar Gaddafi has a reputation that has run the gamut from eccentric revolutionary to international pariah over his long career. 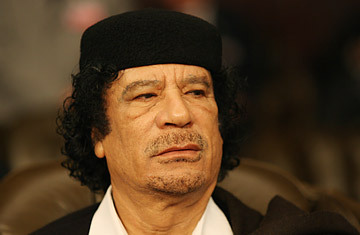 Often seen swathed in animal skins and surrounded by a posse of virgin female bodyguards, the colorful leader has become as well known for his unusual personality as for his controversial political moves, the latest of which included celebrating convicted Lockerbie bomber Abdel Basset Ali al-Megrahi's return to Libya. Never one to stray far from the limelight, Gaddafi marks his 40th year in power on Sept. 1  a milestone that makes him the third longest serving head of state in the world after King Bhumibol Adulyadej of Thailand and Britain's Queen Elizabeth II.  Born in 1942 to a Bedouin family in the Libyan desert region of Sirte, he graduated with honors from the University of Libya before pursuing a British military education.  Inspired by the pan-Arabism ideals of nationalistic Egyptian President Gamal Abdul Nasser, a 27-year-old Gaddafi successfully organized a coup to overthrow Libyan King Idris I in 1969.  Gaddafi is the longest-serving head of state in the Arab world.  After taking power, he launched a "cultural revolution" during which he removed all traces of former colonial and foreign influence, ranging from street signs and village names to the economic and political structure of the country.  In 1977, Gaddafi invented a system of government unique to Libya called the "Jamahiriya," or state of the masses, in which the nation is supposedly governed by the populace through local councils. Though Gaddafi technically holds no formal office through this system and is officially known only by the title Brotherly Leader and Guide of the Revolution, he is still considered the de facto leader of the nation. The Jamahiriya, however, has been dismissed by several international observers, including the CIA, as a military dictatorship.  Gaddafi has sponsored revolutionary efforts in Chad, Sierra Leone, Liberia, Morocco, the Philippines and Iran, including providing financial support to the IRA and the Palestinian Black September movement responsible for the 1972 Munich Olympic killings.  His adopted daughter was killed in 1986 in a U.S.-led bombing of Tripoli and Benghazi in retaliation for the Libyan government's suspected involvement in the bombing of a German disco that killed several U.S. service members.  His daughter Aisha was part of late Iraqi President Saddam Hussein's defense team during Saddam's 2005 trial.  After two Libyans were accused of planting a bomb in 1988 on Pan Am Flight 103, which exploded ever Lockerbie, Scotland, and killed 270 people, Gaddafi's refusal to extradite the suspects to America or Britain led to drastic U.N. sanctions. Gaddafi finally admitted responsibility for the attack in 2003 and paid more than $2.7 billion to the families of the victims, initiating the end of Libya's international isolation.  "All right, then nobody can complain if we ask pregnant women to make parachute jumps."  "The whole world knows that it was a premeditated murder. The file contains enough evidence for the world."  "The important thing is why the medical team injected the children with AIDS. Who ordered you  was it Libyan intelligence, American intelligence, Israeli intelligence or Bulgarian intelligence? This is what we have to find out."  "There is no state with a democracy except Libya on the whole planet."  Defending Libya's Jamahiriya system in a conference at Columbia University in New York City on March 23, 2008.  "It is your decision to respond to the call for unity, to push Africa forward towards the United States of Africa."  In his inaugural address as chairman of the African Union, Feb. 2, 2009.  "We can call it Isratine."  "The Libyans have got a long rap sheet. Blowing up people is one of the things they do."  "Gaddafi is not perceived as a dictator in the Arab world."  "I think his time has come. He's worked for it. I think it's up to us to make sure it comes out best."  "The Libyan government continues to imprison people for criticizing Gaddafi. Hundreds more have been 'disappeared.' Libya has no independent NGOs and the government tightly controls all forms of public expression."  "People are infuriated that a financier of terrorism, who in recent days gave a hero's welcome to a convicted terrorist, would be welcomed to our shores, let alone reside in our city." See TIME's top 10 news stories of 2008.